As expected, Kang will check back into the starting nine after the Pirates granted him a three-day break to tighten up his swing amid his terrible start to the season. Kang was among the top sluggers during the Grapefruit League slate, but that power production has yet to show up consistently in the games that count. 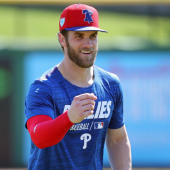 He has one home run and a pair of doubles through the Pirates' first 14 games and has struck out in a whopping 38.1 percent of his plate appearances.